Sign up for a course at SEW-EURODRIVE today for a more efficient day tomorrow! Keep your knowledge of drive technology and automation up to date and always have a direct line to the latest state of the art. Qualification is and remains a crucial component in successfully getting ahead of the competition. Development periods are getting shorter and shorter, especially in technical fields, making continuous learning an increasingly important factor in future success. 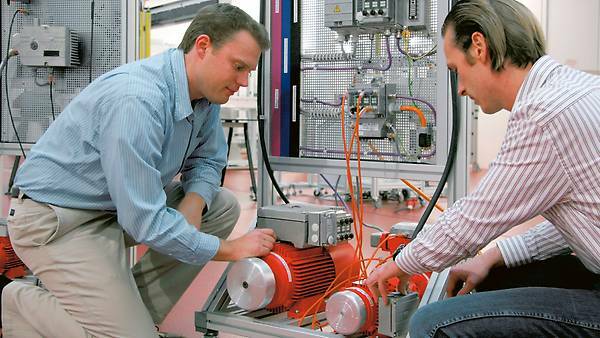 As one of the leading specialists in drive technology and drive automation, we offer our customers extensive and multifaceted practical product training. This allows us to create the ideal general conditions for you to practically work with modern drive technology. The latest learning methods, multifunctional training models and a fully equipped environment ensure the most learning possible. A targeted orientation on the customer also ensures you high learning efficiency. Contact us today for a customized course after your wishes and needs. Because our seasoned trainers focus closely on real-life use and offer numerous exercises on training models. With regular training at SEW-EURODRIVE to always give you a direct line to state-of-the-art drive technology. With the expertise you have gained that helps you plan and use your drive technology more efficiently. With our targeted training with which you can plan your systems more efficiently and minimize downtime. Do you want advice regarding our seminars? Our training experts are ready to answer your questions. Just send us a message!